An iIlluminated clock in the tower of St. Thomas` Church subscribed to by all members of the community commemorates those who served in World War One. A war memorial in the form of an illuminated clock in the tower at St. Thomas' Church was dedicated and unveiled at Avoca on Saturday. The dedication ceremony was performed by Rev. F. Taylor, and the clock was unveiled by Mrs. L. Shelton, who was the mother of three soldiers, two of whom were killed in the Great War. 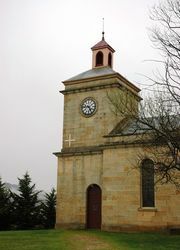 The clock, which is all Australian, was made in Sydney, and was subscribed to by all members of the community of Avoca. The clock erected in the tower was supplied by Taylor and Sharp. of Hobart and installed by Mr. T.Duncan of Duncan & Payne Hobart. The face of the clock is four feet in diameter. The clock, which cost about £100, is worked on the dry cell principle, and is connected to the town lighting scheme. The Governor (Sir Ernest Clark) was unable to accept the invitation to unveil the clock, but paid an unofficial visit during the morning on his return trip from the East Coast to Hobart. Both he and Lady Clark expressed pleasure at the type of memorial chosen.